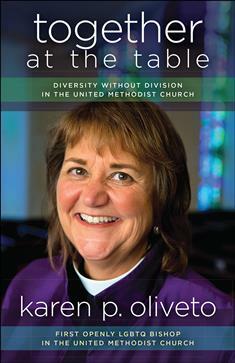 Together at the Table is the personal story and public message of Bishop Karen Oliveto, the first openly LGBTQ person to be elected a bishop in The United Methodist Church. Her election was and is controversial, with opponents seeking to have her removed and some even threatening violence against her. The denomination has been debating the inclusion of LGBTQ people for decades and will be gathering in February 2019 to determine whether it can agree to let conferences within the church ordain as they see fit and let congregations decide what weddings to hold or whether conservative and liberal factions will break off from the denominational body. Bishop Oliveto believes that the church can stay together—that people of different convictions can remain in communion with one another. Woven together with her own story of coming out and following God’s call to ordained ministry is her guidance for how to live together despite differences—by practicing empathy, living with ambiguity, appreciating the diversity of creation, and embracing unity without uniformity.